Today, I’ve been distracted from the furious final dash to deliver the manuscript of my 2nd book on time. There was one post/possible-troll that kept popping up on assorted social media that I just could not ignore. 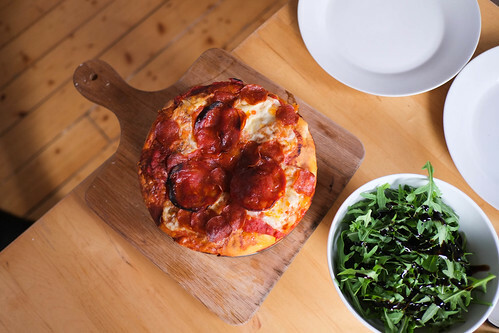 The Pizza Cake. This genius concept (for it is still just that: a concept) comes from Canadian chain Boston Pizza, who are asking their customers to vote for the next pizza trend. Obviously, this is winning and by a mile. 1. 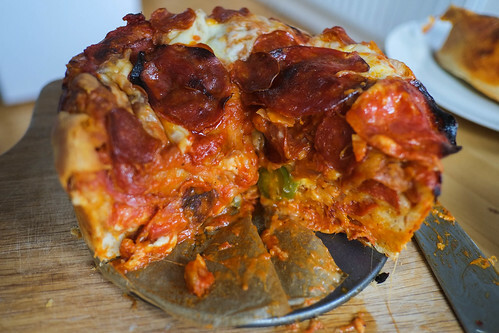 There’s no cake: it’s just a load of pizzas stacked on top of each other. 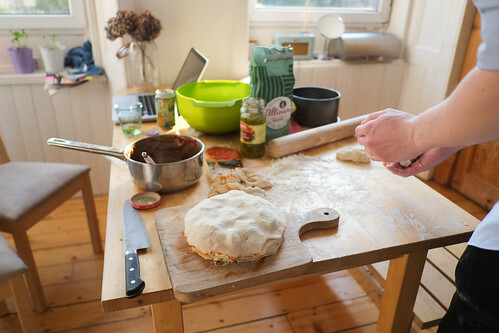 So today, with a couple of friends, I set about creating the pizza cake. And what a success it was. Seriously, it was delicious. But you already knew that. The following set of pictures and steps, however, shouldn’t exactly be used as a perfect guide. I’d suggest a read-through first, to see where I went wrong so you can adjust and improve. I’ve included a set of learning points at the end. Many thanks to Paul and Cathryn for helping me out during this one. 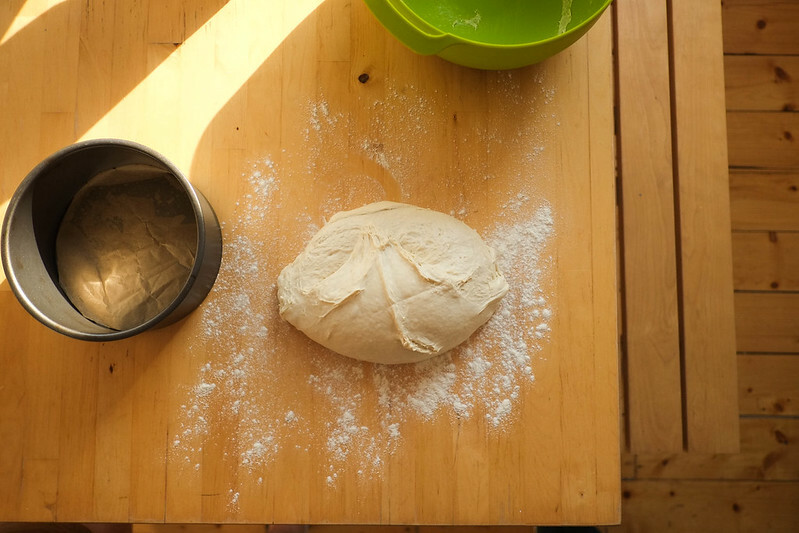 First, make a pizza dough. I mixed the ingredients together in a bowl, covered it with cling film and left it for half an hour at room temperature. 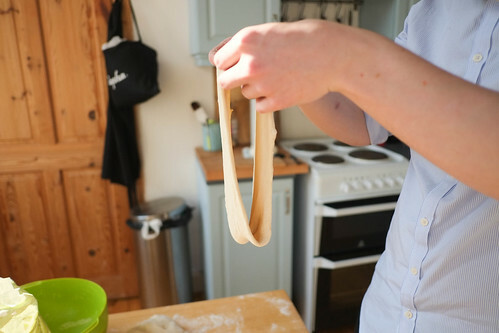 I then stretched and folded it until smooth, then left it to prove another 90 minutes. 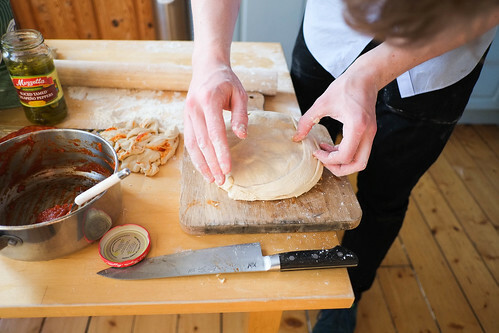 This could all be replaced by leaving your dough overnight in the fridge. During this rest, I made a basic tomato sauce out of chopped tomatoes, garlic, puree and seasoning – you could just use tomato puree. 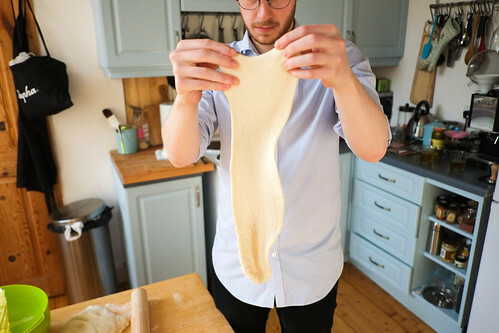 Any pizza dough/sauce recipe will work. My first thought was to start by coating the sides of a high-sided cake tin and then to build the layers up from the inside. 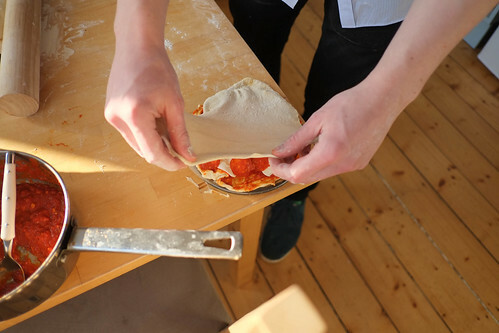 To do this, I cut off a chunk of dough, about an eighth, and rolled it into a rough rectangle. 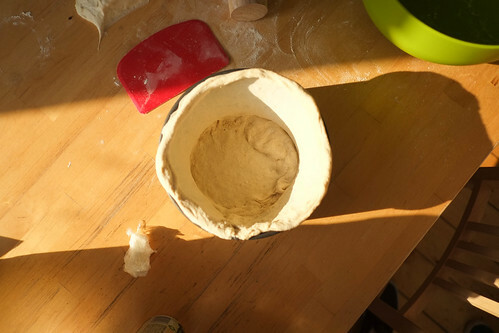 I then lined the sides of the cake tin with this cylinder, cutting off another chunk of dough and rolling it into a rough circle to line the bottom of the tin. 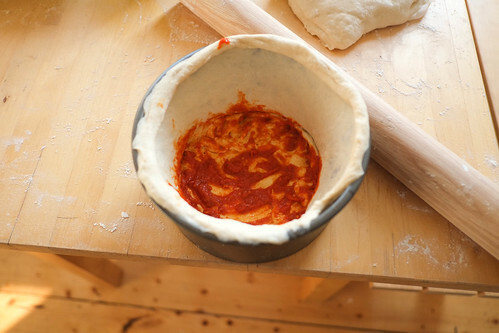 However, quickly after spreading the first layer of thick tomato sauce, I could see that the dough was gathering in a thick layer towards the bottom. This method wasn’t going to work. So I removed the bottom from the cake tin and cut off all that excess dough from the sides. Leaving a disc covered in about a tablespoon of tomato sauce. 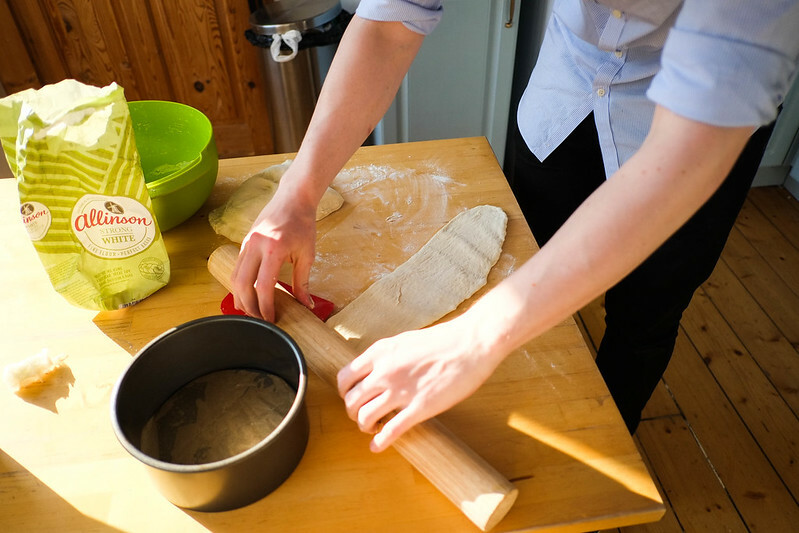 If attempting at home, this is how you should start. 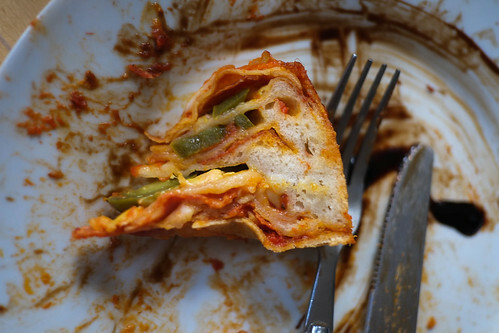 Bake your pizza cake in the oven for approximately an hour, until a golden brown colour. If you have a thermometer, you want the inside temperature to be over 90C before proceeding. Check it regularly. 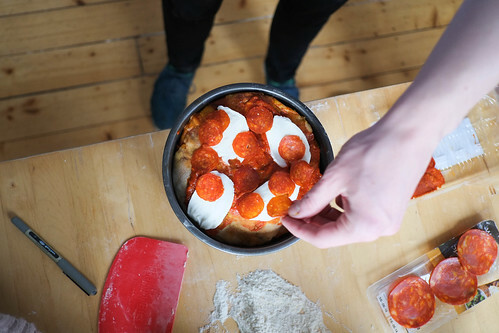 Once baked through, spread your remaining tomato sauce on top and build a final pizza layer. 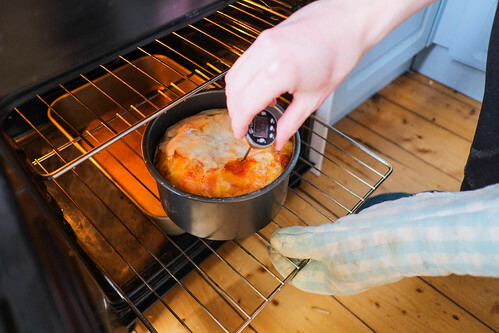 Turn your oven up to maximum. Serve, and enjoy. You will enjoy it. Served with homebrewed beer and cider, extra jalepenos, cornichons, mayo and sriracha. Nom. The inner layers were soggy. 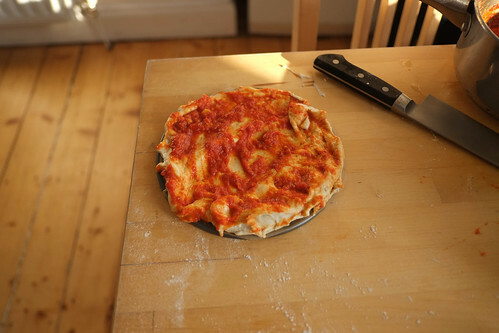 This was due to the wetness of the cheese and the tomato sauce, as well as probably underbaking. 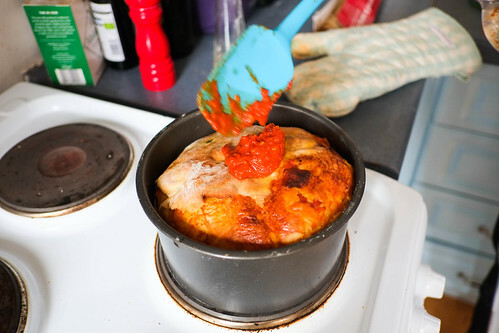 If trying at home, make sure your tomato sauce is reduced until a thick, dry paste. 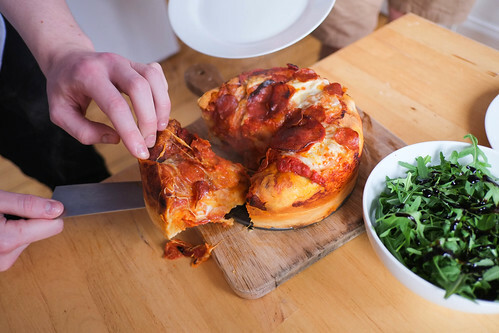 Bake your pizza cake for bloody ages. Building up the sides first is a waste of time. 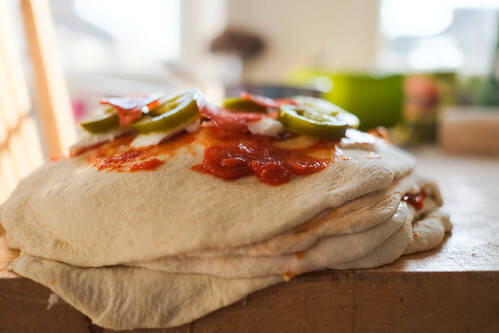 Build it up like lots of pizzas, then cover the sides. It’s never going to look like it does in the picture. The only way to achieve this would be to par or fully bake lots of different pizza bases and stack them on top of each other. This is against the principle of the thing, in my mind. I hope you enjoy baking this. I did. James, this looks awesome. Thanks for all of the tips. Looking forward to trying this out with my children very soon. Best wishes. Despite what the name might suggest, Boston Pizza is actually a CANADIAN chain. This is a very important distinction to Canadians everywhere. 😉 They did this crazy thing last year that was like a calzone with an entire burger patty in it. It was surprisingly good. Apologies! I shall correct immediately. Mine was of course an absolute mess (I don’t have this knack you speak of). Tastes bloody amazing though. Wow. Now that is decadent! 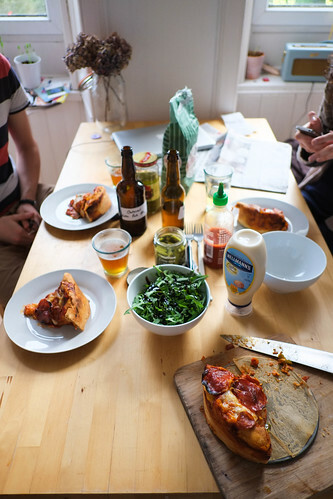 I love how people keep coming up with new versions of food, pizza pie, cronuts – what is next!? 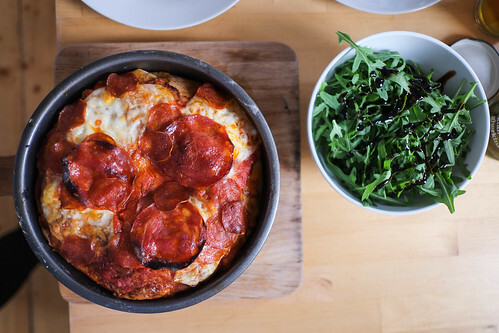 I just made your normal pizza from brilliant bread for dinner today! It tasted and looked amazing! 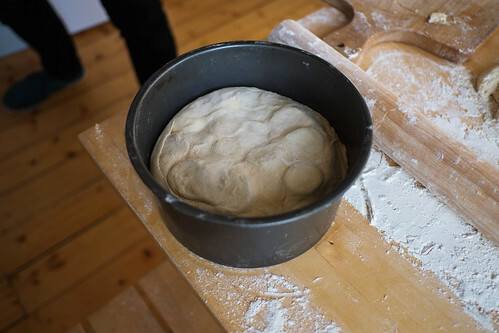 The only problem I had was that when I mixed the dough it was REALLY wet, so I found it very hard to knead, even with a dough scraper and liberally floured surfaces… Do you have any tips for this, or should I just not put as much water in next time? 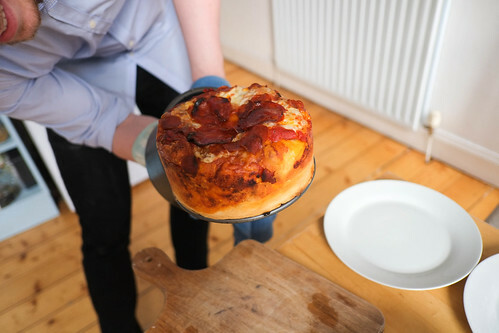 This just reminded me of plans I had last year to create pizza cake. My idea had been to line the walls of a round spring form tin with slices of sandwich cheese, not burger slices but the really uniform ones you get flat packed in supermarkets now. 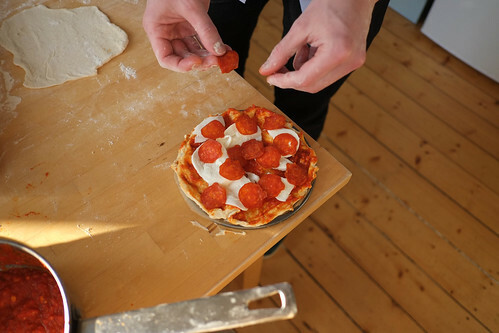 I’d then layer up my pre-cut bases and toppings up to the top of the tin, and finish with a base and another perfectly crafted layer of cheese slices. 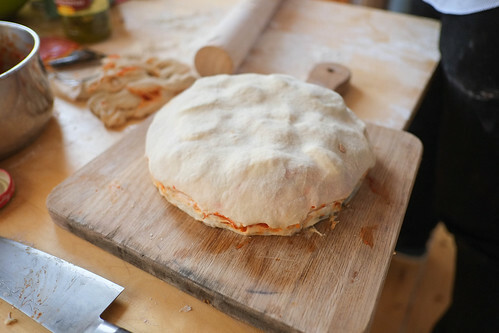 Now in my head, after baking, the tin was removed and I was left with a perfect round yellow tablet, not unlike a cheese wheel, but when cut you’d have perfect layers of pizza inside. The reality of this would likely have been very different, but for now I’m sticking with the picture in my head. It’s a happy place. Great recipe! 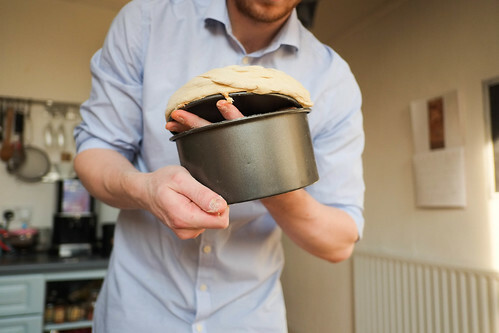 The easiest way to get cakes out of loose base pans is to place a can on your kitchen surface and put the tin on top of it, then simply pull the ring part downwards. Works better than holding it in your hand anyway. 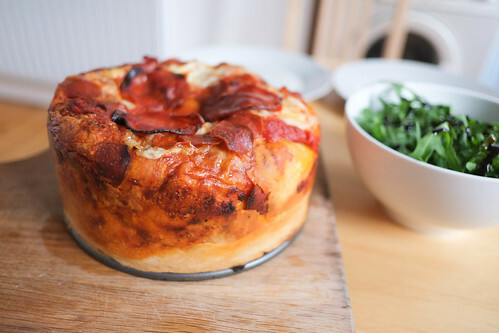 Hey James, Dying to try the pizza cake- it looks awesome (perhaps after my Highers are over!) I tried the ‘anywhere bread’ today, and it was the best thing ever. Just wondering with regards to the cheese scones in your book, do you still add sugar? Presuming you live in the UK, can you please tell me what brand of mozzarella you use? Thanks in advance! How about lining the base and bottom. Stick tin in freezer for about five minutes. Then add each layer and put the tin in the freezer intermittently. Might that work? No, please do not tell me to do it, because I would then have to eat the results. And I could. All by myself. check out my pizza pies!